"The greatest love story of all time bursts into the 21st century in this phenomenal adaptation of William Shakespeare's Romeo and Juliet. This contemporary interpretation of Shakespeare's enduring romantic tragedy is set to become a signature production for dance lovers. 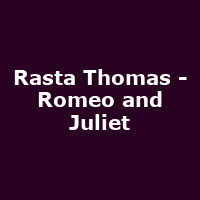 Set against a backdrop of state of the art architectural light design and big screen video projections that will take you from the 1600s to the present, the tragic teenage love story is retold by Rasta Thomas' extraordinary dancers. This intoxicating cocktail of dance from ballet to hip hop to acrobatics fused with a radical mix of music from Vivaldi and Prokofiev to Jay Z, Lady Gaga, Katy Perry and David Guetta, will take your breath away. Choreographer Adrienne Canterna and artistic director Rasta Thomas, have used their innovative style to tell the timeless tale of star crossed lovers. This new genre of dance combines a heady mix of audio visual elements and weaves a dance tapestry that is emotionally charged and technically evolved to create a sensual, moving and passionate production that will enthral audiences."